MadgeTech announces continued worldwide expansion by officially naming Sensocon GmbH the MadgeTech distributor for Germany. MadgeTech data loggers are known worldwide and over the past 20 years have grown to be an industry leader for data logging solutions in over 50 countries. The team at Sensocon bring years of experience and expertise in measurement sensing tools and technologies. By becoming an officially appointed MadgeTech distributor, Sensocon is now able to offer state-of-the-art MadgeTech data logging solutions to an array of industries. While it may seem like MadgeTech is a new brand in the German market, the product has actually been in actively in use here for quite some time. The product line has previously enjoyed exposure under the brand ‘Wachendorff’. This new partnership with Sensocon represents a move to establish the MadgeTech brand in the German market, where quality and dependability are highly valued. "Germany is world-renowned for its commitment to process quality, technology, and adherence to the strictest industry standards. We feel this makes a great fit for our product," says MadgeTech Sales Manager, Chris Des Beins. Germany is now known as the third biggest market for medical technologies in the world. "A highly technical product requires a strong knowledge of both industry standards and product function. We are fortunate to have such a well-qualified company as Sensocon to represent our brand in this key region," continues Des Beins. With the ever-expanding capabilities of data collection devices, and a continued emphasis on quality measurement in the life sciences, we are eager to introduce this key partnership. Together, we are poised to help provide the tools to facilitate effective and efficient regulatory compliance needs across the full spectrum of industry. From sterilization validation, vaccine temperature monitoring, cryogenic storage, to ambient and environmental temperature and humidity recording, Sensocon and MadgeTech have the solution. 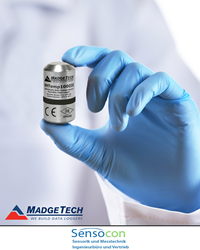 For more information on MadgeTech data loggers, click here, or, contact Sensocon.